New Zealand is known for having some of the best holiday parks in the world. This style of camping shouldn’t be confused with ‘roughing it’ in the wilderness. In fact, staying at a typical New Zealand holiday park in your motorhome rental is more like ‘glamping’ (glamorous camping) than camping. No need to sacrifice creature comforts or sleep (stay awake!) on rocky ground. Most New Zealand holiday parks have been around for decades - set up to cater for the huge number of locals who long to pitch their tent for a couple weeks and enjoy their favourite summer pastimes with family and friends. Kiwi couples and families love to vacation at these holiday parks. So much so that camping rivals rugby as the national pastime. New Zealand holiday park owners figured out a few years ago that if they also cater for the campervan market, they will get customers all year round and they get to meet lots of lovely international visitors as well. The hundreds of commercial campgrounds across the country offer a range of amenities from the very basic to the full-on resort. They are usually friendly family-run businesses and provide a good opportunity to meet other travellers. Holiday parks usually provide good quality amenities including a 240V main power hook up, internet, communal kitchen and laundry facilities, BBQ areas, TV lounge, fresh water filling and waste water dump station all on a secure site. Some also offer heated pools, shop, restaurants and even bike or boat hire. While all holiday parks cater for couples, some particularly target families. These usually have a playground packed with more things to climb and jump on than you can imagine like the obligatory trampoline or even the exciting ‘jumping pillow’ (a favourite with most kids) plus tennis courts, library, go kart hire, and some even have a games arcade. You may even find a rope swing over a river for the ultimate in Kiwi summer fun. A typical New Zealand holiday park is set in an attractive park-like surrounds with lots of grass and trees. Forget the astro-turf you’ll find at a typical campsite in the US. Many are located near a beach, lake or river. Your camping spot usually includes your own power plug in and picnic table. You can cook in your campervan or use the communal kitchen – a great way to meet other campers, both locals and tourists. 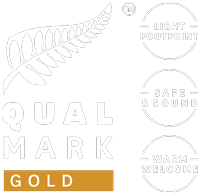 The best way to determine which are the best holiday parks is to check the Qualmark rating and online customer reviews. You’ll feel at home at a New Zealand holiday park in any Wilderness motorhome. We recommend you hook up your motorhome to 240v mains power about every three nights to top up the batteries so you’ll want to find a holiday park. Make a Reservation or Just Turn Up? Timing is everything when planning a New Zealand holiday park trip. The whole country goes on summer break from around December 26 through January so campsites fill up necessitating advance reservations. If you want to avoid the crowds, March through May is autumn in New Zealand and a great time for campervan touring. Temperatures range in the 20s and dry days still outnumber wet ones. Set aside those stereotypes, because New Zealanders make camping (or “glamping”) more comfortable, convenient and fun than many hotel-based vacations. Here are a selection of holiday parks which has been recommended by one of the Wilderness community (team or hirers). All of these parks cater for campervans and motorhomes. All have a mains power hook up so you can recharge your batteries and operate some appliances that require mains power as well as fresh water refilling, plus shared cooking and bathroom facilities. Many also have a dump station for emptying campervan waste water. The level and standard of amenities varies from site to site but, in general, you can be confident that any of the parks you choose will give you a warm welcome and a comfortable rest.